Don Dudley, Murano II, 1967. Acrylic lacquer on aluminum, 22.5 x 22.5 in. Photos: Cary Whittier. All images courtesy of the artist and I-20 Gallery, New York. Last spring I went to a dinner in New York at the loft of the artist Don Dudley. In the seventies he made some great Minimalist works that literalized flatness as structure as well as surface, and he exhibited a modular piece at the Whitney Museum of American Art in 1972. By the eighties he was exploring the space between painting, sculpture, and design by producing object-like works that embodied a sense of imminent functionality. A selection of Dudley’s work from 1966-79 is currently on view at I-20 gallery in New York, his first solo show in 25 years. I’m not sure how, but the conversation that night drifted around to the subject of Dudley’s having come east in 1968 from LA. This was perhaps a strange time for a young artist to leave, just at the moment when Southern California was emerging with an art world identity of its own. There was a new sensibility developing, an attitude that was characterized as “cool,” and broadcast an in-your-face hedonism at odds with the darker stance affected in New York. On the East Coast, artists inhabited abandoned manufacturing spaces and tended to identify with the workers in the old iron and steel industries of the rust belt. In Los Angeles, by contrast, artists were more aligned with small, specialized contractors in the aerospace, automobile, and furniture-building industries. They were experimenting with new materials and finishes—plastics and resins, molded wood, aerosol paints—to make work that examined the phenomena of space and light, the forms of an car-dependent mass culture. These artists ranged from Larry Bell to Robert Irwin, Peter Alexander to Craig Kauffman, Billy Al Bengston to Ed Ruscha. Many of them showed with the resurgent Ferus Gallery, by this time no longer a beat collective but an ambitious commercial enterprise.1These diverse artists were united by the principles of color, materiality, precise craftsmanship, and intellectual rigor. In the midsixties Dudley was a young artist trying to break into this scene, finding it more closed than he would expect. Don Dudley, Skysnare, 1966-67. Acrylic lacquer on aluminum, 84 x 21 in. The story does not end here, though. Dudley was planning to hang some of these works in his loft on the occasion of his eightieth birthday party. After some further discussion I offered to host the party and exhibition at my house. The resulting installation included ten works, all of which are are on aluminum that is very slightly convex and is supported from behind by a thin wood structure. The works are modest in size, ranging from squares (22 by 22 inches) to tall (84-inch) verticals whose rectilinear forms slightly taper from 22 inches at the bottom to 19 inches at the top. The vertical edges of all the works are very thin, so rather than protruding they hug the wall. In this manner Dudley counters the thickening of the stretcher bar that began with Jasper Johns and Frank Stella as a means of emphasizing painting’s objecthood, and which Tony Delap was using at that time to illusionistic ends. Dudley’s works appear at first to be monochromes, but they really aren’t. The colors range from a decoratively appealing palette of whites, to saturated yellows and violet and blue metallic (metal flack-looking) pigments. Liminal shifts of color and tone produce noticeably different spatial and perceptual effects. In part this is because Dudley used industrial lacquers with a Murano antireflective coating, whose application in differing directions catches the light in a distinct manner. The destabilizing effect of the paint, the shape, and the convex surface emphasize the integral relationship between each painting’s physical size, materiality, composition, and form. Don Dudley, Sky Prism, 1966-67. Acrylic lacquer on aluminum, 21 x 21 in. The slightly bowed surface causes shifts in color, or appears to. In some cases, such as in Sky Prism, or the vertical Violet Prism, a spectral effect (or halation: a bright patch of light) has been painted into them. In Murano I, II, and III, the color shifts respectively take place at the edges or inversely down the center. 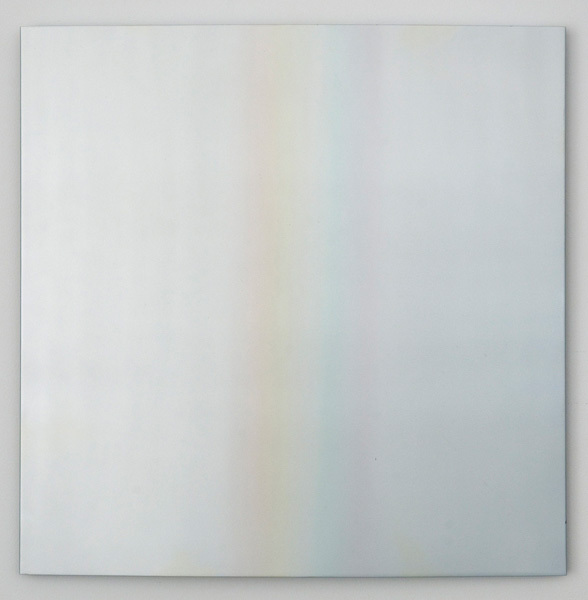 These effects at first look as if they are a result of reflection or refraction due to the slight bowing of the work’s surface, rather than Dudley’s intentional intervention into the literal nature of the work. The one exception to this formula is Skysnare, a lyric, multicolor, almost Rothkoesque vertical work whose soft-edge transitions from orange, to yellow, to white to blue from bottom to top push the work in a direction where object, optical effect, and color transitions do not come together as an integrated transcendent whole. Given Dudley’s pared-down vocabulary and ostensible anti-illusionism or literalist approach, we might think of him as a formalist. Yet his works articulate a very different type of formalism from the one being practiced on the East Coast at the time. 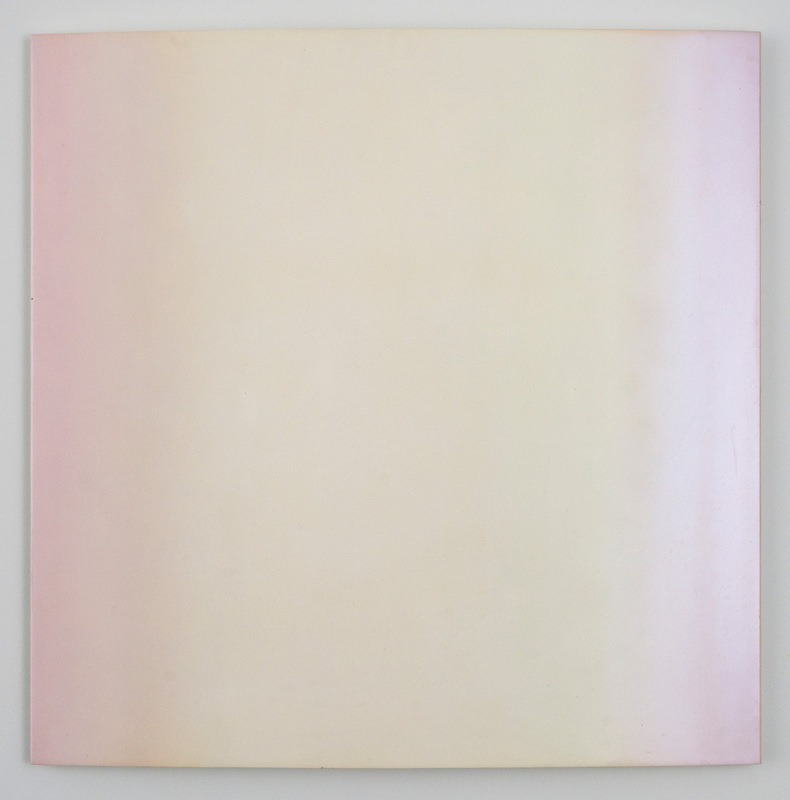 These works’ particular qualities move beyond the reductive definition of painting as object and process that was being advanced by Brice Marden and Robert Ryman, and instead encourage a more phenomenological or analytical understanding of painting (both the act and the thing) as being a complex assemblage of material characteristics and optical effects. Yet they are more physical and material than works by Robert Irwin. The exciting thing about this group of works, beyond their aesthetic effect, is that they are a reminder of the multifaceted issues concerning color, surface, and materiality that stem from Minimalism’s (and art concrete’s) concern with the ambiguous nature of painting’s objecthood. In turn, from these works one gets the sense of an important course within Minimalism as well as abstract painting that has gone unacknowledged and unexplored. This is not to imply that Dudley didn’t follow the right path, given that the specific objects, which all deal with oblique observation of the seventies, are equally rich—and if things were reversed I would probably be bemoaning the fact that Dudley had followed the course indicated by these paintings, rather than the one he did. Saul Ostrow is the Art Editor for BOMB Magazine and the Chair of Visual Arts and Technologies at the Cleveland Institute of Art. He was co-editor of Lusitania Press (1996-2004) and editor of the book series “Critical Voices in Art, Theory and Culture” published by Routledge, London. Since 1987 he has curated over 70 exhibition in the US and abroad. His writings have appeared in numerous art magazines, journals, catalogs, and books in the US and Europe. He regularly writes for Art in America.